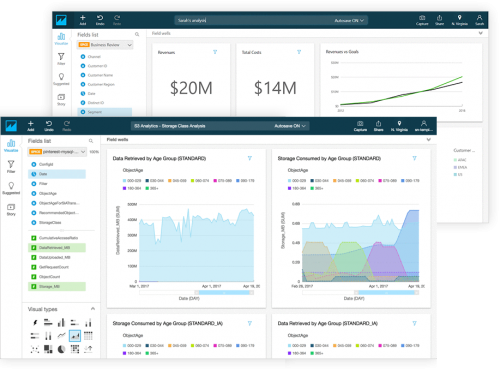 Amazon QuickSight is a fast, cloud-powered business intelligence (BI) service that makes it easy for you to deliver insights to everyone in your organization. QuickSight lets you create and publish interactive dashboards that can be accessed from browsers or mobile devices. You can embed dashboards into your applications, providing your customers with powerful self-service analytics. QuickSight easily scales to tens of thousands of users without any software to install, servers to deploy, or infrastructure to manage. With the industry's first pay-per-session billing model, you only pay for what you use. This allows you to give all of your users access to the data they need without expensive per-seat licenses. QuickSight's pay-per-session pricing means you only pay when your users access the dashboards or reports. QuickSight scales automatically to tens of thousands of users, without requiring any additional infrastructure or need for capacity planning. Enrich your applications with QuickSight dashboards and charts, while saving time and money on development and maintenance. QuickSight easily integrates with your cloud and on-premises data sources including native integration to AWS services. As an AWS APN Consulting partner, we are experts in helping you to gain insight into your customer and an edge over your competitors by surfacing the right data for your sales and marketing teams. We publish a wealth of tips, customization examples, and reviews of useful tools that work with Amazon QuickSight. To learn more visit our blog.